1. Nice win Saturday night at the Cable Box, 102-97 in OT over the Trailblazers, who were wrapping up a 4 game road trip. AP story here, box score here, PopcornMachine.net game flow here. The Bobcats have now won three in a row and five of their last seven. They are 9-8 since the J-Rich trade, have moved to 16-24 overall, and creep up a bit in Hollinger’s Playoff Odds. 2. Let’s go ahead and get it out of the way: The Dunk. 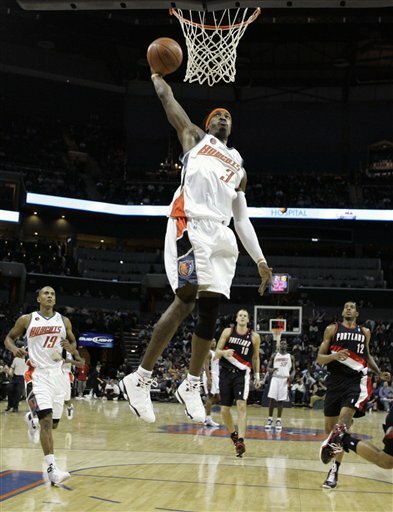 With the Bobcats down two, six and a half minutes left in the fourth quarter, Gerald Wallace make a backdoor cut. Felton spots him and tosses a nice, soft lob. Greg Oden, patrolling the paint, realizes what’s going on — but just a beat too late. Wallace is already way above the rim, slamming the ball towards the basket with his right hand. Oden makes contact with Wallace’s body, forcing him backwards simultaneously. Gerald barely finishes off the jam, and crumples backwards from Oden’s contact. The immediate crowd reaction was kind of muted. But enough people realized what they had just seen and leapt to their feet in amazement. That was enough for all the rest of the fans to turn their eyes away from Rufus, or the dancers, or their kid making funny faces while he throws popcorn around and look towards the action. As Gerald gathered himself and the ref made the foul call, they showed one replay on the video board, then another one. By that time, a majority of the crowd was up, giving Gerald a standing ovation. You need to see this dunk — here’s a good version of the video. Easily the dunk of the night in the NBA, and probably in the running for one of the top dunks of the year so far. To top it off, it was Oden’s fifth foul, and Gerald hit the free throw to give us a one point lead. And if it needed more topping, on the next trip down the floor, Gerald took the ball baseline and hit a whirling layup to draw Oden’s sixth and foul him out. Gerald also converted that three point play to give the Cats a four point lead midway through the fourth. Amazing sequence. Now is obviously a good time to comment on Wallace’s overall game: it was awesome. Gerald finished with 31 points (10-19 FG, 10-13 FT), 16 rebounds (3 offensive), 3 assists, 2 blocks and a steal. The only problem with Gerald’s game is that he wasn’t involved much in the overtime period. Not his fault, though. Larry Brown seems intent on (showcasing?) putting the game in Raymond Felton’s hands almost exclusively down the stretch. 3. Let’s not bury the lead under all of Gerald’s awesomeness, though. This was another tough, close game that the Bobcats were able to pull out. Winning these kind of games is really uncharted territory for the Bobcats, and it’s hopefully more than just a lucky stretch. Ideally, it’s a real effect of Larry Brown and the personnel moves that he’s engineered. The Cats have become a team that executes very well in clutch situations — it’s no longer a given that they’ll fold under pressure. After that big sequence, the Cats continued to maintain a small buffer. Felton hit a layup with a little over a minute left in regulation to give the Cats an 88-83 lead. However, the Blazers came right back with a Rudy Fernandez three and a LaMarcus Aldridge jumper to tie the game up. Felton and Roy then traded clutch buckets to leave the game tied at 90 with nine seconds left. After a timeout, the Cats were able to inbound the ball to Felton, who probably waited too long to start his move and could only get up a contested, fading 20 footer that clanged off the rim at the buzzer. In OT, the Bobcats played good defense and were able to limit the Blazers to 3-10 shooting and seven points on another Rudy Fernandez three, and buckets by Aldridge and Roy. On offense, as I’ve already noted, Larry Brown put the game in Felton’s hands. As a result, the Bobcats shot 4-7 in the extra period. Felton was responsible for one of those buckets on two attempts, and assisted on two others. He found Okafor with a nice pass for a big dunk, then later found Diaw for an open three. Conspicuous by their absence from the play-by-play of the Bobcats OT possessions are any turnovers or shots being blocked. Larry Brown preaches precision and accountability from his point guards, and Raymond Felton is delivering right now. 4. Felton finished with 16 points, 5 rebounds and 7 asssists (vs. 3 turnovers). Since we’re clearly going to be moving him before the trading deadline, his recent strong play has really been a boon. Hopefully, we’ll be able to package Mohammed with him and get back someone (or something… a pick?) useful. 5. Aside from Wallace and Felton, Okafor also played well: 22 points (9-14 FG), 11 rebounds (5 offensive) and 3 blocks. The Blazers were never able to get any consisent inside offense going against him. Aldridge finished with 21 points, but they were almost exclusively on mid-range jumpers. And Greg Oden was decidedly underwhelming, fouling out in only 18 minutes with just 8 points. 6. Quiet game for Boris Diaw (except for the huge three in overtime). With Carroll gone and Portland sporting athletic wing players (i.e. no good matchups for Adam Morrison), Shannon Brown got some run and played OK. And Juwan Howard continues to provide useful minutes off the bench, going for 8 points on 4-5 FG in 13 minutes. 7. The Portland spin on this game is that it was the end of a 4 game road trip, so there was a fatigue factor in play (fair enough) and that Roy had an uncharacteristically quiet game with some really poor free throw shooting. My quick thoughts on the Blazers: they have two young stars in Roy and Aldridge and a lot of intriguing potential talents. The collection of young talent that they have amassed is certainly enviable; but I’m surprised that they’ve been able to win as much as they have with little to no veteran presence. It’s really a testament to Nate McMillan, I suppose. Anyways, looks to me like they need to figure out which of their young talents is the long-term solution at PG, either Rodriguez or Bayless. Bayless had some really nice moments driving the ball for easy baskets last night. If he can learn how to run a team and get everyone involved, they’re in good shape with him. But it’s difficult enough for a “true” point guard to learn how to be an NBA point guard. When making everyone around you better has never been an interest or a strong suit, it’s going to be even more difficult. Plus, bad body language from that guy on more than one occasion last night. Not exactly how I want the point guard for my young team behaving. 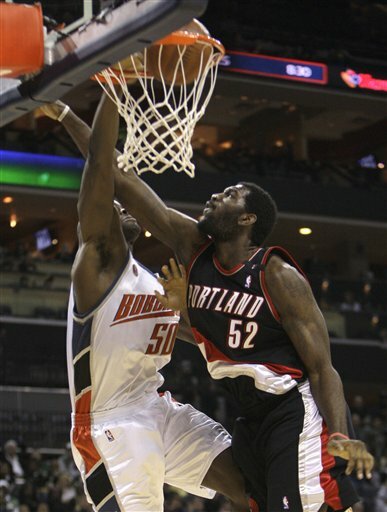 Additionally, the Blazers obviously need to give Oden some time. He did not look good last night: mechanical and gangly at the same time on offense; slow and old, yet green on defense. Once the Blazers figure out some of these questions, they will still have plenty of young talent to package in a trade for a veteran to put them over the top. That is, if anyone around the league is willing to deal with them. 8. One last note: Sean May must be down under 260 pounds, because he was activated and dressed out last night. He did not see any playing time, but had giant ice bags wrapped around his knees during the first and third quarters while seated on the bench. Does he really need iced down after jogging through the layup line? 9. Next game is a Monday afternoon home matinee for MLK Day: the Spurs come to town for a 2:00 start. Bobcats win their third straight over the Portland Trailblazers Saturday night 102-97 in OT to notch their 3rd straight victory and improve to 16-24. Can you smell .500!!!??? AP recap here. Box score here. Wallace’s 31pts (on 10-19) with 16 boards (!) and two BIG time blocks set the tone for the rest of the team and had the Bobcats playing to win from the very beginning. This was one of those nights when you remember how good Gerald is and how much the team relies upon him for creating offense in the lane. The dude is so fast when he’s on the break and just goes to basket and is willing to take the hit. Statistically, GFORCE may not be having his best season (yet) but as an all around ball player, he’s really been evolving to another level. Maybe that benching against the Wiz last week was exactly the prescription he needed. 3. Trust us Raja, the pleasure is all ours. Bell completely shut down Brandon Roy in the first half (2pts) and pestered him late on a couple of drives that prevented Roy from every getting anything going. And while Boris Diaw struggled seriously with his shot (2-9) he tied with Felton for the team lead in assists with 7 and hit a absolutely huge 3pt basket late in the 4th to end the Blazers push. Speaking of Raymond, another nice game for Sir Trade Bait as he showed some major cajones down the stretch, hitting an off-balance 12 foot bank from the top of the key to put the ‘Cats up and then had a nice dribble drive shot opportunity (the one’s I usually hate) in OT that was good enough for Okafor to tap back out for an offensive board. 4. The Bench. Although Adam Morrison looked completely lost (as usual) coming in to rest Wallace, the ‘Cats can breath a sigh of relief at the completely surprising efforts of one Juwan Howard. Who knew that this guy still had something in the tank??? He added 8pts (4-5 shooting) and some serious veteran stability in the 13 minutes he played and is all of a sudden making Brown/Jordan/Higgins look like Joe Dumars or Geoff Petrie. Nice work from Juwan. Unfortunately not all was great from the bench. Nazr Mohammed should be nicknamed “BuzzKill” for his incessant lack of effort/energy. The guy just isn’t a Brown-type player and I very much foresee Felton being moved before the deadline for, if anything, to package with Nazr and get him off of the books. What a waste. 5. Great home win for the Bobcats and with Spurs coming to town on Monday for MLK Day, why not make it Four in a Row with new big man DeSagna Diop showing up just in time to help shut-down Tim Duncan. Enjoy the win, ‘Cats fans.